nice way to start ur blogging carrier sir…….nice words above ..
Bhai …!! You haven’t mentioned about Fashion Show….!! Remember 2 Prize and the PPT…!! Yes, I remember that bro.. that was awesome… but fashion show was after 3 weeks and this post is about our first week.. will update the next parts soon..
can you please tell me how many months did u take to get your offer letter and call letter as I was placed in infosys on 13Sept,2011 during campus drive.So,when should I expect to get it for me??? ?Please reply soon if possible on my email ……. I got my offer letter exactly 3 months after getting selected in campus recruitment drive. I am not sure if there is any particular identifiable pattern in the way they send offer letters. It is like i am telling my experience….. Feeling same being in infosys mysore…. well i want you to solve my query,i got placed in the month of december 2011,got my letter of intent a month back so when can i expect my appointment letter? I heard infy is goin on loss and they are delaying the date of joining,is it true? You do not require parents to accompany you on the date of joining. Rest all answers you would find in my previous replies. 1)can we get outof the camps and into the city anytime??? 3)how are the rooms allocated..
4)heard the training is very tough..so how hard is it??? It would be very nice of you and all the others who are trying to seek answers about Infy training, that you read all my replies before asking anything. You will find most of the questions already answered. I do not want to stop responding on this thread, but if redundant questions will keep popping up, I may need to stop answering them at all. You can check all my posts about Infosys in Life at Infosys Category and can read question-answers in comments of each post. Actually, you need to read the comments on all the posts where I have replied to many questions. Regarding structure of training, it keeps changing frequently. So, the way it happened for me, may not be the same for you. Hangout places is a good idea. I will try to include them in my future posts. Hi Abhi, first of all thanks to you for writting such an awsome blog, keep writting. I want to know that does infosys sends its employee to abroad just after completion of training.If yes, then what are the chances and mandatory(do i need to learn a foreign language?) for this..?? Thanks Jai. Regarding your query, as I have already answered, everything depends on the project you get..
hi abhineet..my DOJ is 15th october 2012…few of my friends got e-joining mail but i still did not get…i have treid logging in using that link and i got logged in…do u think i should fill up the details for e-joining or wait for my mail??? See if you have missed the mail or it has gone to spams folder. If not, you should get the mail soon as your account is activated for e-joining. sorry bro its not there..but i got yesterday my accommodation and medical details mail….in that it was mentioned that e-joining is mandatory before joining so thinking to wait till 10th..if i dont receive any then thinking to do it with that link which friend sent…wt to do u suggest abhineet?? Ok. I think that should be fine if you are able to log in. Along with this, on the safe side, you may also try contacting Infy HR regarding this. infy HR?? ?is it by mailing to offer_update@infosys.com??? Not sure about the contact channels. You are on your own to find them. i am sitting idle at home ryt nw… n my DOJ is in june 2013.. is there anything i can study before so as to make my training little easier, any languages or technical knowledge ?? Thanks Sunil for replying. I hope Sakshi got a good picture of what preparation she needs to do before training..
Sakshi, a small suggestion, try to practice all your hobbies in this time because believe me, you are not gonna get this time again.. All The Best..
hi..i got ma DOJ as april 15 2013…..role is operation executive…job level 2….could you give me some details about the nature of this job???? Sorry I have no idea about this role.. It is a beautiful post sir. My doj is on 22th July and want to ask you about a problem . I downloaded the e-joining personal data form and I surprisingly found my gender marked as female . My name in the candidate Profile page is addressed as ‘Mr’. Please suggest what should I do. Contact Infosys and inform them about this error. They will fix it. sir u said that friends were allotted different classrooms…how were they alloted..i mean what pattern did infosys followed..by roll nos or by names or randomly?? Both. In my case, they used names, in my friend’s batch, they allocated on the basis of employee numbers. September 2011 had their doj in May 2013.Do they usually take this much time ? As far as I know, there is no fixed rule. Sir,a Perfect blog..n got much info which I was looking….thank you! I just want to ask that working for infosys is a good option or not, i mean people keep saying that joining infosys is not a good option because of the steady growth and that you never will get to work on the things that a good IT professional suppose to do and your career growth would be very slow. Sir, Infosys sent me email with the DoJ on 25th May 2015 and I had an important ceremony to attend on 29th May( Friday ). Will I able to move out of the campus for the next two holidays. I wanted to know if we are free on the first week. I had my interview on 26th September, 2014 and I am from an electrical background. I am still awaiting my offer letter. Whereas, students from other department (CS) have received theirs. Is it something to worry about? Greetings! Sir, such articles are really appreciable and are a great source of knowledge for a fresher like me. My DOJ at Infosys is 13th July and I am in a confusion as I was also selected by TechMahindra through campus recruitment last year. But, I am yet to receive a letter from them regarding my DOJ. Confusion is whether I should board the flight to Mysore or should I wait for TechM’s letter (main subject of confusion here being career growth and opportunities in coming years of my life). This can only be cleared by an experienced senior like you. Also, my little concern is about the location of job. I have heard that in TechM, there’s a scope to get your preferred location , but at Infosys, it’s all luck. Waiting for you to throw some light. Thanks for reading this blog. I am a little late to answer you. In the initial years of your career, do not worry about location a lot. After 2-3 years, you can easily move to your preferred location either by asking for relocation or switching to some other company. I am a fresher .i got offers from infosys and cognizant .i am in confusion where ahould i join and why? I got selected on January but still now I hv not got my call letter.. what shall I do now.. I sent many mail to offer_updates..
Well, you should remove this post in earnest, my dear friend IMHO. You are doing a disservice to people. Indian IT service companies are bane for the Indian society. 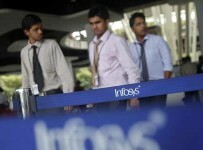 And Infosys is probably the spearhead of all the IT service companies in India. There are far better companies in the world to work for. You mentioned training in Infosys. And sadly you think it is “world class” You should know that there are excellent institutes in India and abroad who are doing cutting edge research and making tremendous advances in science. The training one gets there is “world class”. Infosys and other such companies are creating donkeys and workhorses whose only aim in life is get a fat salary, purchase a car and a flat and go “onsite”. They don’t care about our nation. It saddens my heart learning that too many people are so complacent with their “IT” jobs. Such companies have created many jobs, true! But people never consider the implications it had on India. Lacks of people are migrating to metros, contributing to their already messed up town plannings. It has created traffic problems. And many serious issues. It’s because people are too complacent in their meager jobs, too few people wish to pursue higher education. If you really care to learn and live a meaningful life, aim for better companies or pursue research. Hi, I got selected in Infosys, Congnizant and Wipro. I am a CSE B.Tech student. I would like to work on areas like networking and securities (i am a certified eCH), cloud computing. Which company is good to grow across projects? Which company gives more opportuinities? It is very difficult to say where you will get good opportunities. All three of them have good number of cloud & network security projects. But, as per the trend and my experience, whichever of these you join, as a fresher, it mainly depends on the random procedure they follow to assign you to technology streams during training & then to projects. So, its more of luck by chance. Previous Previous post: In love, its never too late, or is it?